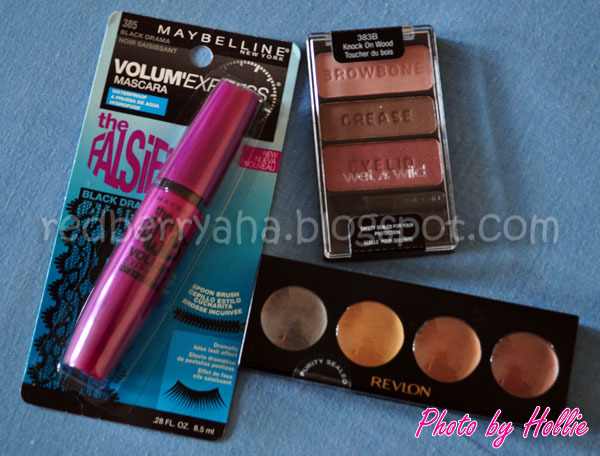 Random Beauty by Hollie: Makeup Gifts! I was all giddy and happy when I received these gifts from a friend who recently arrived from Florida USA. (Thanks Loien! luv ya!). I also received a couple of chocolates but I forgot to take the photos, I already ate it...lol. She also wanted to give me an elf Beauty Encyclopedia, too bad it was out of stock at Targets and Walgreens when she looked for it. huhu... But oh well, I'm very grateful that she gave me "Pasalubong". She gave me Maybelline Falsies Mascara, Wet n' Wild coloricon trio palette in Knock on Wood and a Revlon Illuminance Cream eyeshadow in Precious Metals. I will definitely be using all of these so stay tunned for the swatches and reviews. I've always wanted one of those Revlon palettes!! @Elaine, thanks, I love all of them. @Sugar sugar, sure, I'll post an FOTD on using these. @Debi, Yes I agree. They're really nice base, but I've tried wearing them alone it lasts long. I love it. @Minakichu, yeah, they're awesome. you should try it. Oh how I wish I have a friend who'll give me MU's for pasalubong!!! @Ayieh, hahaha. It feels great to have makeup freebies...hehehe. I hope she gives me another MU when she comes back next year. Guess I should you bring you more when i go back in December. Let's keep those posts coming 'cause I need some pampering myself. Take care! You are most welcome.